"What's not to love about anything with feta, spinach, sun-dried tomatoes, garlic and mushrooms in it? The best thing about these is that they are easily prepared a day ahead or frozen and eaten later. These are perfect to have for company along with a nice salad and the Chocolate Lava Cakes for dessert." Place chicken breasts in a large resealable plastic bag. Pour in Italian dressing, seal tightly, and refrigerate at least 1 hour. Place the stale bread, Parmesan, thyme, and pepper into a food processor. Pulse until the bread is processed into crumbs. Seat aside. In a large bowl, stir together the feta and sour cream. Set aside. Heat the oil in a large skillet over medium heat. Stir in the garlic. Then add the spinach, and cook until it wilts. Stir in green onions, cook 2 minutes. Remove spinach to a plate, and leave any liquid in the pan. Stir in mushrooms, and saute until soft. Remove mushrooms to plate with spinach. Allow to cool briefly, then combine spinach and mushrooms with feta and sour cream mixture. Stir the sun-dried tomatoes into the mixture, and spread onto a large cookie sheet. Place in the freezer for about 30 minutes. Place chicken breasts on a cookie sheet, and place about 3 tablespoons of the filling mixture in the center of each breast. Roll the breasts, and secure with a toothpick. 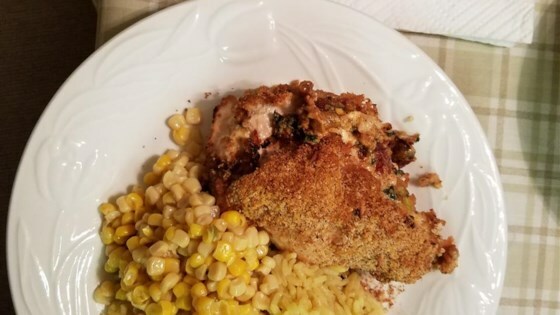 Transfer chicken breasts to a baking dish, and sprinkle breadcrumb mixture over chicken breasts. Bake, uncovered, in a preheated oven for 25 minutes.